Astro Ria will be airing a new reality TV show with eight university students teaming up to raise RM50,000 for a leukaemia patient, Sim Yee Lim. Unlike other reality TV shows in which the winners get to take home prizes, Misi Suara Hati (MSH), which makes its debut this Sunday holds no rewards for the champion. Astro head of programming Zainir Aminullah. Instead, all the participants will emerge as champions if they manage to raise the funds required within a month. The undergraduates, between ages 18 and 38, are pursuing degree courses in Malaysian universities such as Universiti Kebangsaan Malaysia, Universiti Putra Malaysia and Kolej Universiti Islam Malaysia. The participants are law students Jegatish Kumar Kasavan (23), K.B. Elena Hong Tze Lan (21), Mohd Taufik Mohd Tasrip (24), Sheelasheena Damian (21), computer science student Juliza Tupon (21), English literature student Azmir Azamshah Azim (23), medical bioscience student Abdullah Alias (23) and Literature and Linguistic student Asotha Batunable (38). The students are able to participate in the show as they are on semester break. The 25-episode MSH is a collaboration between Astro and Yayasan Budi Penyayang Malaysia (Penyayang). Nazril Idrus hosts the show and Wasitah Mohd Yusof acts as advisor to the participants. 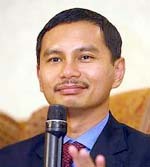 He added that Astro and Penyayang came up with the show as a result of the popularity of reality TV shows. “Astro Ria’s Akademi Fantasia was a huge success. We came up with this idea as it is a good way to get Malaysians involved in charitable deeds. This is a genuine case and we hope to raise as much money as possible for Sim,” said Murali after the launch of the show in Kuala Lumpur recently. Datin Paduka Seri Endon Mahmood is the chairman of Penyayang. She officiated the launch of the programme, witnessed by the foundation’s chief executive officer, Leela Mohd Ali. The participants, who are members of Kelab Penyayang, were chosen by their respective universities based on their personality, maturity and academic excellence. Nineteen-year-old Sim, who hails from Cheras in Kuala Lumpur, needs to undergo a bone marrow transplant. Sim is in dire need of financial aid as her mother, who works as a cleaner, is suffering from breast cancer. Her father is a mental patient who earns RM600 as a labourer. Misi Suara Hatiis a reality TV show with a twist. It has eight university students raising funds for a leukaemia patient within a month. Clockwise from left: Host Nazril Idrus, Azmir Azamshah Azim, K.B. Elena Hong, Abdullah Alias, Jegatish Kumar, Asotha Batunable, Sheelasheena Damian, Mohd Taufik Mohd Tasrip and Juliza Tupon. MSH makes its debut this Sunday at 9pm, with Profil Misi Suara Hati, which explains the aim of the show and introduces the participants. From April 4 till 29 on weekdays at 8.30pm, On Jurnal Misi Suara Hati will be aired. It will feature the participants’ progress in achieving their mission. Sepintas Misi Suara Hati will be aired on Sundays on April 10, 17 and 24 at 9pm. The three shows recap the participants’ week-long events and advancements. Countdown Misi Suara Hati is scheduled for April 30 at 11.58pm. It will highlight the latest updates and the amount collected as a countdown to Konsert Gala Misi Suara Hati that will be aired live on May 1 at 8.30pm. The concert will be organised by the participants and it will involve Malaysian celebrities and artistes. The total amount collected will be announced on the night of the concert. Astro head of programming Zainir Aminullah said: “Teamwork amongst the students is important. They will have to work with various organisations to ensure that their mission works. They will be racing against time and viewers can witness their effort and success. Misi Suara Hati joins Astro Ria’s (Astro Channel 4) this Sunday at 9pm with a repeat on Monday at 6pm. To find out how you can donate to the fund, please tune in to the programme.